Tilted Horizons: Huge Adventure Gear Giveaway! RevZilla is giving away some awesome Spidi gear this month. 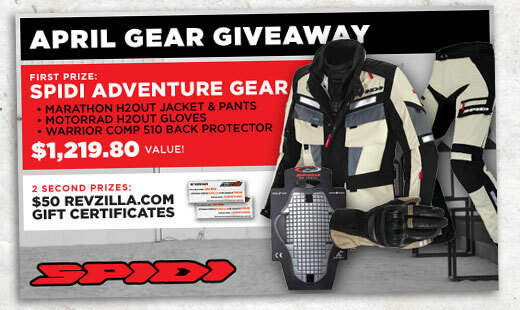 To enter, click over to RevZilla's April contest page. The big winner this month will receive Spidi's Marathon H2Out jacket, Marathon H2Out pants, Motorrad H2Out gloves, and a Warrior Comp 510 back protector! That, my friends, is over $1200 worth of gear. Two Second Prize winners will receive $50 Revzilla gift certificates.